Anti Doping Lab Qatar (ADLQ) concluded its annual symposium at the Torch Ballroom in Doha yesterday. 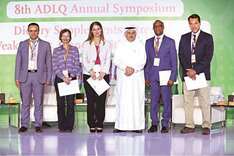 The eighth version of ADLQ Annual Symposium was titled ‘Dietary Supplements: Strength, Weaknesses, Opportunities and Threats’. The event was opened by ADLQ Board of Trustees chairman Prof Mohamed al-Maadheed, who explained the importance of such a topic to the public as much as to athletes, looking at dietary supplements strategically and trying to emphasise the importance of educating the public about them. World Anti Doping Agency (WADA) director general Olivier Niggli, talking during the opening session of the symposium, said supplements are a problem for many reasons, like it being an unregulated industry and that the products usually have unreliable ingredient information among other issues. The sessions of the first day concentrated on explaining more about dietary supplements with a lot of examples confirming that some of these supplements do include prohibited substances which result in the athletes suffering the consequences. The first day had speakers from all over the world sharing their expertise and views on the matter. The audience enjoyed fruitful presentations by Professor Ron Maughan from Loughborough University, also chair of the Nutrition Working Group of IOC Medical Commission; Dr David Mottram from Liverpool John Moores University, and Dr Andrea Gotzmann, Chairwoman of NADA Germany, among others. From Qatar, Dr Stephen Atkins from WCM-Q and Dr Ahmed Babiker from MOPH were present on the first day. The second day continued with a whole session dedicated to a study being performed by ADLQ scientists about the Impact of Sport Performance Enhancing substances on Metabolic health. The presentations followed with different views and perspectives on the subject and were wonderfully concluded by a panel discussion moderated by Dr York Olaf Schumacher, sport medicine physician and head of sub-speciality medicine at Aspetar.